19 year old Begimay Karybekova was crowned Miss Kyrgyzstan 2017 at the crowning gala held on 5th April 2017 in Bishkek, Kyrgyztan. She bested 16 other contestants and succeeded last year's winner Perizat Rasulbek Kyzy. 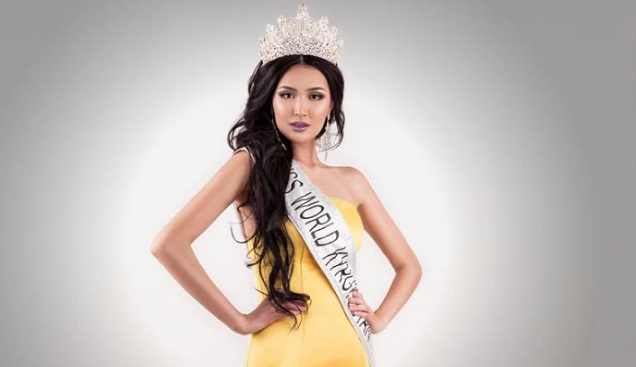 Begimay earned the right to represent Central Asian country Kyrgystan in Miss World 2017 in December in China. Begimay is not new in the glitz of pageantry. She was won Grand Prix in Miss Tourism Eurasia and represented Kyrgyz Republic at the Top Model Of The World 2016. She also right to competed at the Miss Intercontinental 2016 pageant in Sri Lanka. People’s Choice awardee Aicgurok Mamatemirova was first runner-up while Gulzada Islambek kyzy was the second runner-up.